At first glance, it would seem that silicate floor hardeners are a great choice to strengthen and protect floors in machine shops, auto & truck repair shops, and various other environments that might be exposed to heavy loads, require frequent cleaning, are exposed to greases, oils and other fluids, and want a long lasting treatment. And in truth, many companies do end up installing sililcate floor hardeners in those locations, only to learn the ugly truth… silicates densify, harden and dustproof, but they do not seal concrete. That’s why we developed Chemisil OR (Oil Resistant). 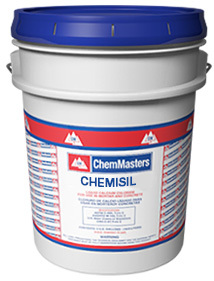 Chemisil OR can be used as part of a two-product system to dustproof, harden, densify and seal concrete floors that may be exposed grease, oil, and various fluids. The first step is to apply Chemisil, Chemisil Plus or Chemisil Plus Li to the concrete floor. Chemisil OR is then applied using the same equipment and technique. Chemisil OR penetrates the substrate and bonds to the concrete in the same way that all Chemisil products do, providing a long-lasting barrier to the absorption of oil, grease, and other fluids. All Chemisil products are water-based. As a result, the entire Chemisil family can be used safely indoors without fear of exposure to solvents or lingering odors. It also means all the Chemisil products can use the same equipment, making application easy and uncomplicated. As an added bonus, Chemisil OR is significantly less expensive than similar solvent-based oil and grease repellants, but just as effective. Don’t fall prey to unrealistic marketing claims for silicate floor hardeners that exaggerate their oil and grease resistance. Use Chemisil OR and as part of a cost effective silicate flooring system, and get a densfied, hardened, dust proofed floor that’s truly sealed against oil and grease absorption. Chemisil Plus OR in combination with Chemisil Plus provides added oil and grease resistance to a chemically reactive system which changes the chemical composition of treated surfaces by filling the pores and capillaries of the concrete matrix with a hard dense gel. Chemisil is a clear, water based liquid chemical floor hardener which reacts with the free lime and calcium carbonate in concrete. It fills and seals the pores and capillaries to harden and dustproof surfaces. Chemisil Plus is a chemically reactive solution of sodium silicate with added potassium methyl siliconate and proprietary components. Chemisil Plus Li changes the chemical composition of treated surfaces filling the pores and capillaries of the concrete matrix with a hard dense gel.